Your figure-work is, as ever, inspirational. Mr. Bull in particular has a very characterful overbearing look. Lovely little tale again Mikkel, I look forward to the next part. 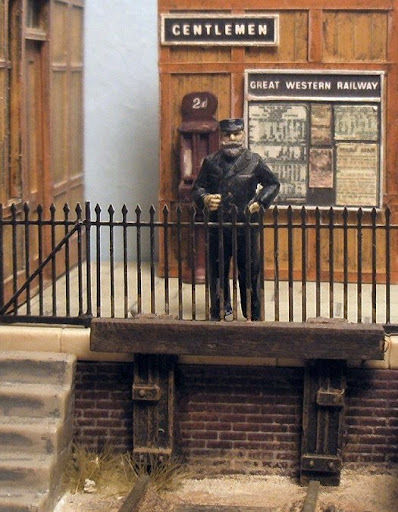 I particularly liked the shot of the Station Master with all the detail around him. Great work. I wonder if I will ever match it? Thanks gents :-) This is the result of another bout of "out of period" operation (normally it's 1906-1907). I don't have much lake-liveried stock, but fortunately with a small layout like this not much is needed. What a wonderful cameo with the story bringing the scene to life. Setting the scene on the eve of war adds to the drama somewhat. There's a shade of 'War Horse' about this but I won't say anymore just in case it's the line your going down. Wonderful modelling and as others have said the figure painting is sublime. Great Modelling and a good story line too. If I was Mr Bull and I lost my head I think I would be a little upset too! 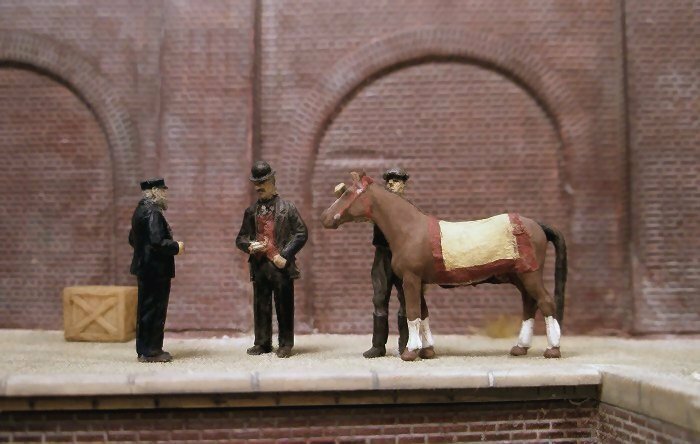 Ah...........the heady days of the railways being a public service industry. Mr Woodcourt looks like the kind of chap I'd like to share a glass or two of sherry wine with! Bravo Mikkel, keep it coming. Photo 2 - So simple yet so detailed. Wonderfull. (The rest ain't bad either!). This is what I love about the blogs - so many different ways to use the format. Brilliant, and a reminder for me to paint my little whitemetal horse to go in the corner field of Victoria Bridge, watching the trains go by! 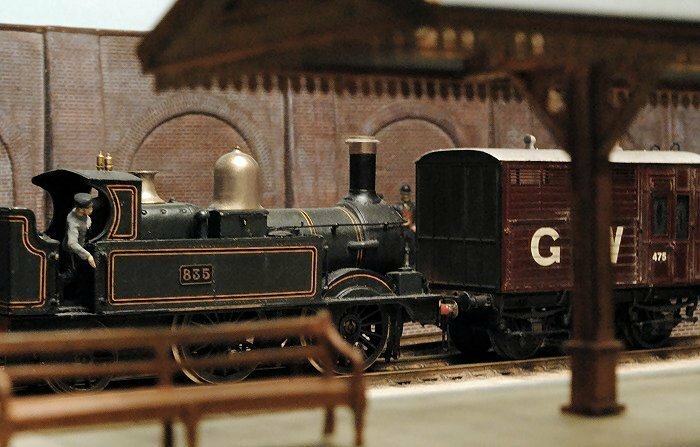 Another wonderfully crafted blog entry...and the modelling is spot on! Agreed with Paul...Photo no. 2 is the one for me. I was trying to decide whether it was lake? I'm still not sure what colour lake should be. I *think* lake should be very dark brown with a hint of plum. There was me thinking someone should knock it off, and than you tell us it already happened and it made him worse. Adds weight to the arguement that violence will not solve problems. Unfortunately we all know what came next! Actually I'm not sure where this is going :-) Just thought it would be nice to explore the idea of a continued story. I've changed the original title though. It occurred to me that war is not an appropriate topic for a bit of light amusement. Granted :-) These days no doubt he would have sued the company! Mr Woodcourt looks like the kind of chap I'd like to share a glass or two of sherry wine with! The horsebox appears to be brass. Is it a current kit, and is it suitable for an earlier date? I like photo 2 as well. It's difficult to take the picture because of the angle, so it cost a bit of swearing. The grass are the sticky Silflor tufts, I toned them down a bit I think. On the issue of GWR lake, the rather brownish shade of the horsebox in picture 4 is a bit unfair to the actual colour, which is better reflected in photo 3. The latter I think is OK for the lake colour? It's similar to this example. 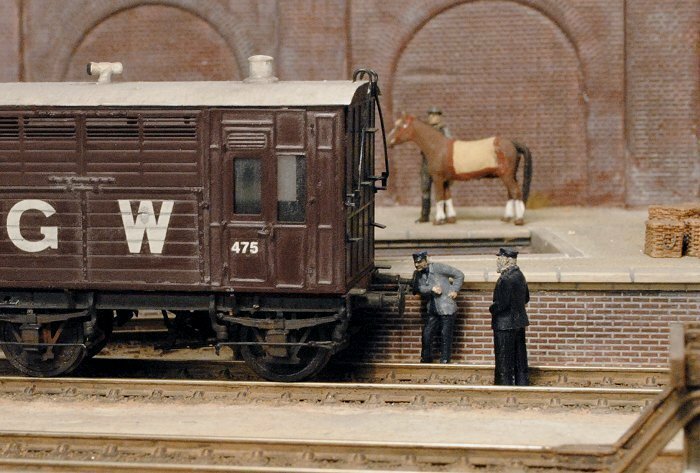 The horsebox is from a D&S etched kit of diagram N4, introduced 1887. No longer available I think? As mentioned it was built by Pete Morris many years ago, possibly for his Drefach Felindre layout (not sure). It is due for a repaint into earlier GWR brown soon (I think the number needs changing, 475 doesn't appear in the lists I have). There are some fabulous layouts on this site, but 'Farthing' is by far my favourite. I'm very glad you carried on with it. Oh, and to my eye, there's nothing wrong with the weathering on that characterful waiting room; spot on! PS Any more videos in the offing? Another master class in the art of story telling and modeling. Yep, photo 2 is my favorite too. By the way, been meaning to ask you where you buy such magnificent kit builds of old locos from (as in the last post) on line (as I live in Ireland getting over to UK is rare). Been browsing on the net, but can't find any sellers. Brilliant Mikkel.You're the Charles Dickens of RMweb !.Happy 200th birthday ! Seriously though your modelling is inspiring. 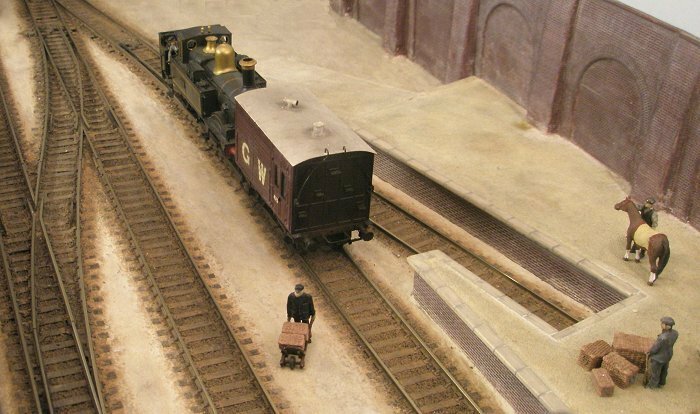 Mike, the s/h stock was mostly collected over many years back in the 90s and early 2000s when opportunities arose - from shops, fellow modellers or via ebay. Then I started building things myself, so not sure what other options than ebay exist these days. Still some stock in the drawer that needs restoring though. When I saw your first title this morning, Mikkel, I thought we were in for an epic... In retrospect, Rob's mention of Dickens is perhaps more suitable than Tolstoy. I reckon Mr Woodcourt in the second picture is looking around for a porter so that he can tell them to tidy up those weeds around the base of the buffer stop. This is the GWR, after all. I remember reading something that referred to a livery as "chocolate lake" but can't remember where it was. Is that what you were thinking of, Rich? Surely the modern concensus is something like the coach on gwr.org that Mikkel referred to? Mind you, when I first saw the Didcot railmotor, I was rather disappointed. To me it looks faded and nothing like as deep and rich as I had imagined. ps. you;ve done it again with the numbers, 535 has morphed into 835, or do you have two 517s? I would love to know how you did your stairs in photo two. Fantastic story by the way. I will eagerly await the next instalment. Yes, best not compare with Tolstoy! Especially as War and Peace is in 4 volumes... Mind you, he also changed the title, it was originally named "1805" (I did not know these things, but Google is our friend). In retrospect I agree about the weeds etc by the buffer stop. Since this is an area visible to passengers, it would probably have been kept free of such things during this time. The 517 number confusion was a typo - now corrected. Thanks for pointing it out. I'm afraid there's nothing ingenious about the stairs. They originally came from a kit, in two parts (stairs and sides). I think it was this one. PS: Noone has commented on the driver's ability to smell a hot axle box from the footplate. I was only joking - I don't suppose you could do that in reality? I remember reading something that referred to a livery as "chocolate lake" but can't remember where it was. Is that what you were thinking of, Rich? Surely the modern concensus is something like the coach on gwr.org that Mikkel referred to? As for Mr Bull - he's living on on borrowed time (or at least his horse is). in a couple of years it will be at The Front - possibly in Palestine. As the war in Europe stagnated, cavalry charges became almost instantly obsolete. The chances of Mr Bull seeing his favourite post -1918 is, sad to say, exceeding slim ('Warhorse' not withstanding!). I'm sure I have read chocolate lake too, but also couldn't tell you where. Maybe in Harris' GW Coaches? On page 35, he writes first about the experimental all-brown livery painted on some coaches "shortly after" 1902. He says this may have been the old Windsor brown, but refers to it as a "chocolate lake" that "would probably" have been a form of "madder lake". He then goes on to mention the 1908-1912 all-brown, which he says "was described [by whom?] as a chocolate-lake". He then says "From 1912, a much deeper shade of chocolate was used for the basic scheme". By this latter statement I expect he means the crimson lake - quite confusing! I must admit I tend to rely more on the HMRS livery book, as I am not sure Harris (whose book is otherwise very good, I think) was a livery expert. As for Mr Bull - he's living on on borrowed time (or at least his horse is). in a couple of years it will be at The Front - possibly in Palestine. I've changed the original title though. It occurred to me that war is not an appropriate topic for a bit of light amusement. I'm not so sure about it not being an appropiate topic, the war did happen and it brought so many changes. If a little bit of light amusement, sensitively done, reminds us of one of the worst periods in European history then that, to me, can only be a good thing.